List of Holiday Specials for 2018! This entry was posted on November 21, 2018 by Rick. Cyber Monday 2018 is here at Buy Two Way Radios! As always, we have bundles, freebies, rebates, and specials to make your online holiday shopping easy for you and your budget. Whether you are shopping for business, hobby, home or that special someone, we've got a two way radio special for you. 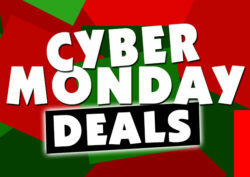 Here is a list of all our Cyber Monday and holiday sales at Buy Two Way Radios for Cyber Monday 2018! FREE Bonus Study Pack with purchase of any ARRL or Gordon West Amateur Radio License Study Guide! Limited Edition Wouxun KG-UV8E Tri-Band Holiday Bundle! This special holiday version of Wouxun's amazing Tri-band two way radio takes their 144MHz, 222MHz and 420Mhz band transceiver, adds a full complement of 16 accessories and add-ons, and puts it all into one big festive package at a super special holiday price - only $159.99! The CB Bonus Pack includes a Two Way Radio Frequency T-Shirt, CB Radio Quick Reference Card, String Backsack and a CB Radio audio CD. Buy a Midland LXT633VP3 Two Way Radio Triple Pack for only $79.99 on Cyber Monday! Buy a Midland ER210 Compact Emergency Hand Crank Radio w/ Flashlight for only $39.99 on Cyber Monday! This Bonus Pack includes a set of two lanyards, 12v USB car adapter, cleaning cloth, Care and Maintence Guide, fanny pack, string backsack, and a Fun With FRS audio CD. Get a $50 rebate on Icom A25N, A25C, or A25C Sport VHF Airband Radio! This is a manufacturer mail-in rebate offer fulfilled by Icom directly. Read the A25N, A25C or A25C Sport product pages for details. Get a $20 rebate on Icom A14 airband radios! This is a manufacturer mail-in rebate offer fulfilled by Icom directly. Read the A14 product page for details. Get a $25 rebate on an Icom IC-M36 VHF Marine Radio! This is a manufacturer mail-in rebate offer fulfilled by Icom directly. Read the IC-M36 product page for details. Kenwood Gift Card and FREE multi-charger offer! Buy at least six Kenwood ProTalk Series radios and you qualify for a $100-$200 Gift Card plus a free multi-unit charger. Amount of gift card varies depending on model purchased. Read the Kenwood promotion flyer for details. Motorola My Choice Rebate Offer! Purchase at least six Motorola CLS, CLP, DLR, RM or RD Series radios and choose one of three rebates: a free radio, a Prepaid Visa® card, or a free Multi-Unit Charger! Rebate amount depends on model purchased. Read the Motorola promotion flyer for details. Midland Biztalk Buy 6, Get 2 FREE Offer! Purchase at least six Midland BizTalk™ BR200 business two way radios radios or one BR200 Two Way Radio Six Pack and Multi-Charger Combo from Buy Two Way Radios and you get TWO MORE BR200 radios FREE! Read the Midland promotion flyer for details. Buy 1 TYT MD-380 battery pack, get one FREE! Purchase a Lithium Ion Battery Pack for MD-380 DMR Radio (2000 mAh) and we will give you one FREE! This BOGO offer is valid through the promotion period or until we run out of batteries, whichever comes first! Buy 2 Baofeng UV-5R 3800mAh high capacity battery packs, get one FREE! Purchase two units of the Baofeng UV-5R High Capacity 3800mAh Battery and we will give you one FREE! This BOGO offer is valid through the promotion period or until we run out of batteries, whichever comes first! Note: These special offers are valid until December 31, 2018 or while supplies last except where noted. Some promo items are only available in limited quantity. No rain checks. When they're gone, they're gone! Offers void where prohibited, taxed or restricted by law. Questions, comments or feedback? contact us. Leave us a comment below. You can also Give us a call, send us an e-mail or enter our live chat online. We'll be open from 8 AM to 6 PM ET during our Holiday 2018 Promotion Event! When will the Ham Radio Starter Kit- Mobile/ Base Station package (featuring the Wouxun KG-UV920P-A) be available again? Sadly, it has been out of stock for a while now. Sorry, which products are you referring to? Could you provide a reference for a comparison?